Sisindu C – the ‘C’ a play on the word ‘sea’ – is every bit the iconic beach house. 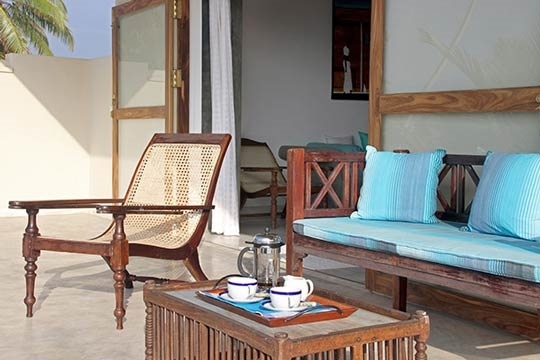 Cosy, comfy and idyllic, its sits before a sweeping stretch of golden sand and mirrors its locale through a soulful colour scheme that draws in the blue of the skies, the greens of the sea and the pale gold of the beach. 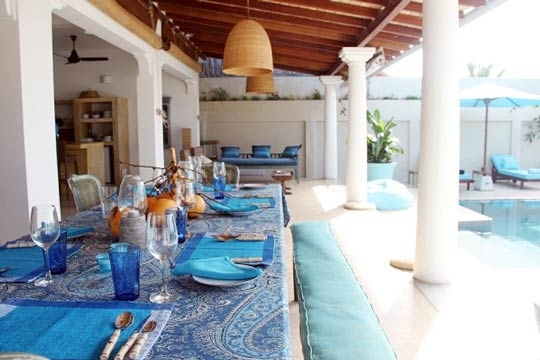 The house’s two double bedrooms both present lingering ocean views, and its living and dining areas are incredibly spacious. An openness to the entire ground floor allows the living space to spill into the garden, and the sea breezes to generously flow through the house, pulling at the edges of magazines, teasing cushion tassels and swaying the oversized ceiling lamps as they go. A stay here is to experience total relaxation. Although the built-in sofas and the cement-moulded kitchen are more exotic in their design than familiar, their tasteful presentation makes you feel immediately at home. 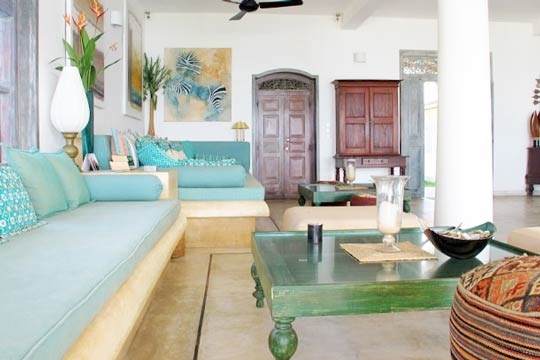 Deep, thickly cushioned sofas stacked with cushions take the weight off your feet, and the inviting turquoise pool lies just inches beyond the pillared dining veranda. 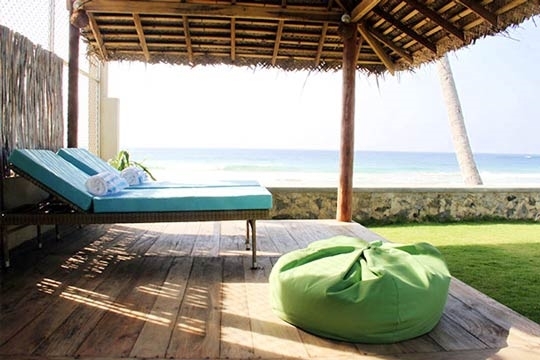 Double mattresses cosseted in wickedly soft towelling fabric flank the pool and urge you to be lazy, whilst sun beds in the shade of a vibrant turquoise parasol invite further languishing. In the end-of-garden pavilion, yet more loungers are perfectly placed for whiling away hours of the day and capturing the most stunning sunset scenes. 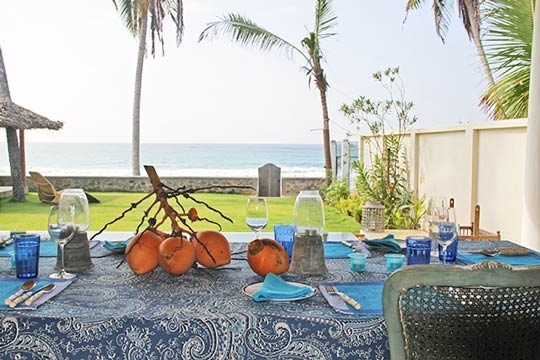 Despite having just two bedrooms, this villa has loads of potential and is ideal for couples and families: it’s a total escape (though being close to Galle, there’s lots to do and see nearby); it’s an idyllic wedding venue for small guest lists, and it’s ideal for celebrating a milestone birthday (especially if booked in conjunction with three-bedroom Villa Saldana right next door). The British owners of Sisindu live locally and sometimes pop over to the house, but otherwise it’s looked after by an ample staff of three. 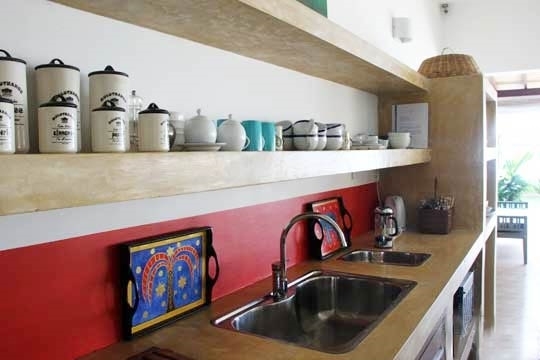 On the team is a cook who takes care of gourmet cravings (meals are charged at cost), although the well-equipped kitchen is designed for self-catering too. I adored Sisindu C; it’s exactly how a beach house should be. 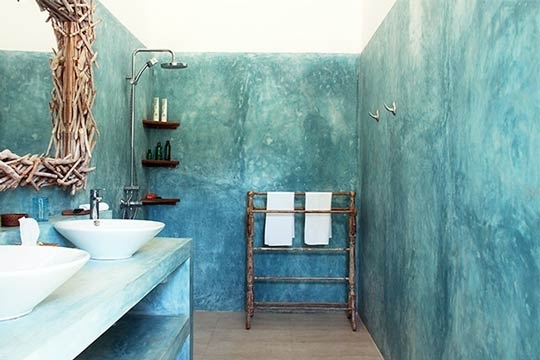 Its lovely openness and its zingy interior design match the feel of the place perfectly. Views of the crashing waves can be enjoyed from almost every room, and nothing beats lying back in bed and gazing at the deep blue sea. Clever use of space makes the house feel really big – considering the size of the living space, this could easily be a three- or a four-bedroom place. Having a walled garden and stretch of lawn, make this a wonderful family villa too (the daybeds in the bedrooms could sleep an extra child if required), and if the kids grow tired of the pool there’s the wide beach to explore just outside, although the sea is too rough for swimming here most of the year. One of my favourite features of Sisindu C is all its great lounging spots – the deep sofa in the living room was sublime for chilling out; the upstairs balcony was perfect for sneaking away; but what I loved most of all were the towel-covered mattresses beside the pool – here you could just lie back, snooze, read a book or gaze at the sky; magical. The small staff team includes a cook so you don’t have to worry about making meals (even though the kitchen is very well-equipped for it). He has enough of a menu to keep you satisfied for days but is always keen to learn new dishes too; and if you fancy a complete change, there are a few restaurants close by. We only tried breakfast at the villa, but were assured by the comments in the guestbook that the cooking was very good. For a two-bedroom villa, the space here is totally heavenly. The sea views – from every room – are sublime and we loved watching the waves make their foamy, thudding journey onshore (the sounds are quite epic at night). The beach stretches a long way in each direction so it’s great for jogging and long exploratory strolls. You can’t really swim in the sea in front of the villa, but there are swimming spots that you can walk to within 10-20 minutes. We headed to the lagoon in front of Why Beach Restaurant, which we would highly recommend for lunch (Italian cuisine), cocktails or just a change of scene. Being close to the main road means there’s occasional traffic noise and the turtle hatchery pumps fresh seawater into their tanks every few days, which can result in some slightly grating mechanical droning. My family and I had the lovliest holiday at Sisindu C. The staff were fantastic, food superlative, beach pristine and the weather divine. Quite honestly I cant think of anything that would have improved our stay. It was just wonderful. 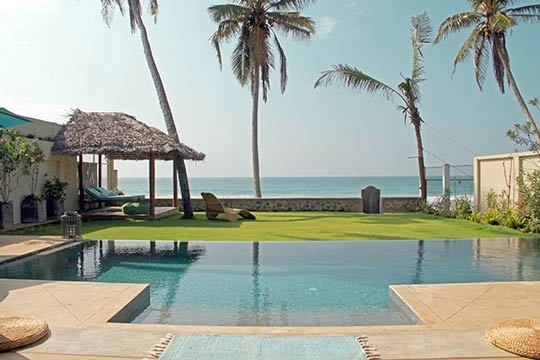 Accessed directly from Sisindu C’s garden gate, Habaraduwa’s long sandy beach stretches out widely to either side of the villa. 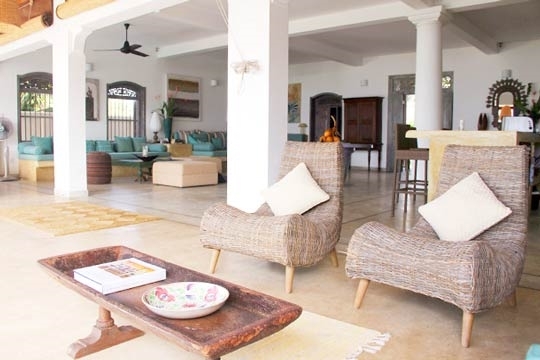 Positioned close to town and within walking distance of a number of local grocery shops, banks and vegetable stalls, the villa is also only 80m from a turtle hatchery where new hatchlings can be set free. 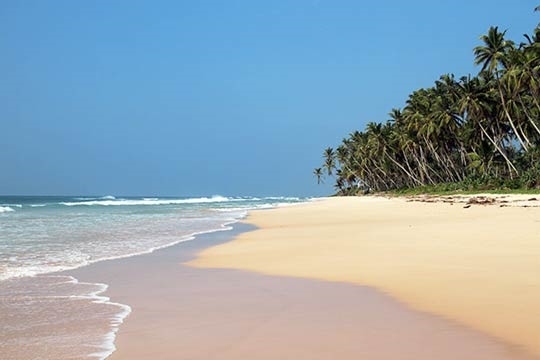 A three kilometre walk or jog along the beach brings you to the heart of Koggala and all its attractions, whilst Galle is just 10km away. Sisindu C has a huge open-plan living area that you enter directly via double antique doors flanked by borders of flowers. It’s a beautiful, wide and very open space with twin pillars supporting high ceilings and, to the front, open arches leading onto a deep veranda, the pool and the garden beyond. Views of the sea are celebrated throughout. On the left is an elongated fully equipped kitchen finished in light yellow cement with a long island worktop and built-in cubbyholes; tall all-weather rattan bar chairs are lined up to one side. Opposite, under the gentle whirr of antique ceiling fans, is a pair of built-in loungers, deliciously topped with stacks of cushions in lovely sea-green shades. 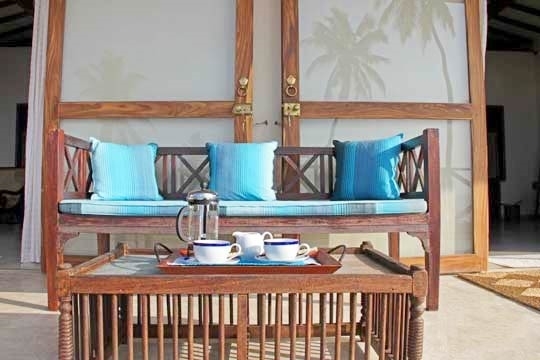 The deep veranda to the front of the living space has a table for six to one side and, on the other, a daybed and some rattan lounge chairs. 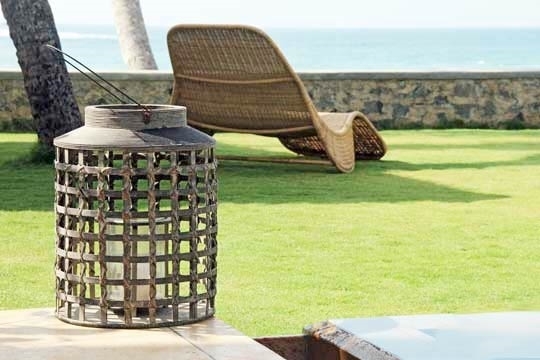 Three large rattan lampshades hang overhead and scatter pretty patterns on the terrazzo floors when lit at night. 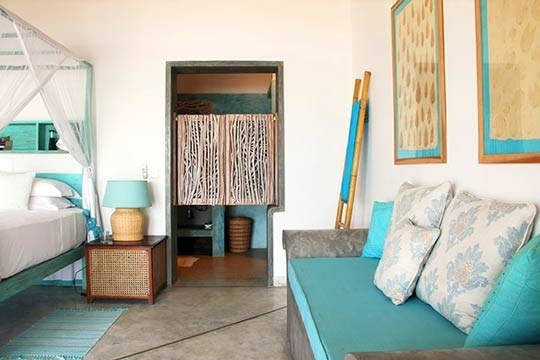 Beyond the veranda is the lovely blue pool with two towelled floor mattresses placed either side of the entrance steps. 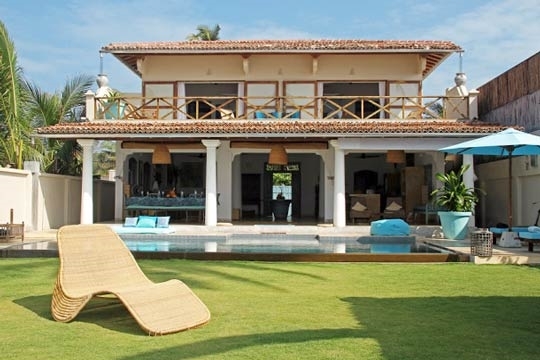 A terrace topped with turquoise-cushioned loungers and a parasol sits to one side and at the end of the garden is a simple thatched west-facing pavilion designed to take in sweeping vistas of the sea and the crimson blush of the sun at the end of the day. The two bedrooms are both on the first floor, accessed by a timber staircase from the back of the house. 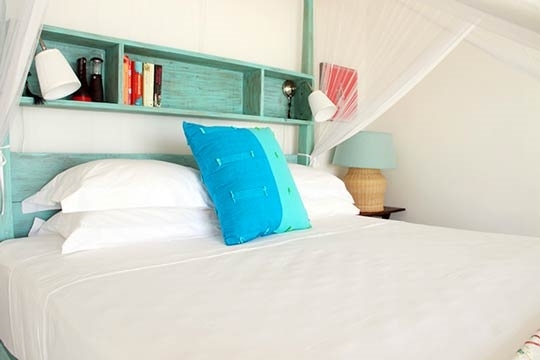 Each bedroom is identical in size and in its bright turquoise décor, and each opens onto a deep balcony equipped with daybeds and loungers, all within view of the sea. 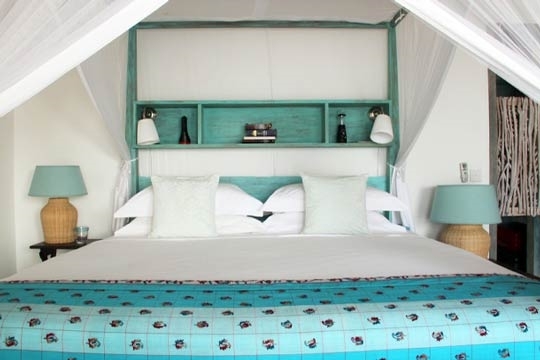 The rooms are furnished with a king-size four-poster bed, a built-in cushioned daybed and a cupboard, their ensuite bathrooms fitted with twin sinks, a shower, shelves and a safe, plus a striking elongated mirror edged in cinnamon wood. To the rear of the living area, either side of the entrance to the house, are a guest cloakroom with shower and a utility room stacked with towels and linen, attached to a laundry room with washing machine. 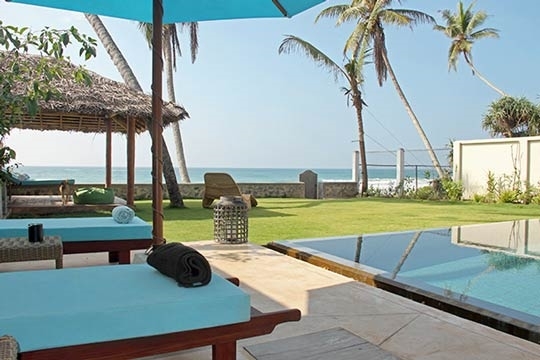 2 bedroom villa located in Habaraduwa-Koggala, South Coast. 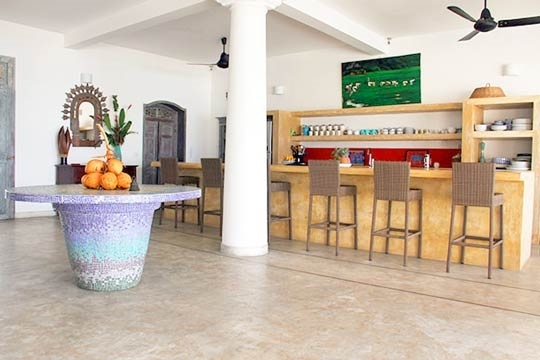 Ideal for Beachfront, Body and soul, Kid friendly, Fair share for groups, Romantic retreats, Sensible for seniors, Room with a view, Walk into town, Perfect for weddings.